Need To Know This: "Surprize" Your Guests Over the Holidays! Hosting a gathering with family or friends for Thanksgiving, Hanukkah, Christmas or New Years? If you would like to add a fun element of surprise to your soiree, check out these party enhancers by TOPS Malibu! The unique items include "suprize balls" and cornucopia cones filled with trinkets and goodies, sparklers, treasure fortune candles and more. TOPS Malibu has created party favors for the Academy Awards, The Grammys, DreamWorks, Disney, Imagine Entertainment and even a Presidential Inauguration! They offer many unique items to choose from for your event. They include Sparklers in the shapes of numbers and letters, Surprize Balls made of colorful strips of crepe paper that unwind to reveal vintage keepsakes, Conversation Games to inspire connection, Wish Capsules to hide a secret or keep a promise, and more. The company will also personalize and create custom products for a special event. Traditionally, a cornucopia is a large horn-shaped container overflowing with flowers and produce, to symbolize abundance and nourishment. These are perfect to bring to a Thanksgiving dinner or to have at your own. The Cornucopia Cones are available in four different sizes, 32" Grande, 17", 8", and a mini. Each contains Surprize Balls and many other themed items. They are also refillable so you can always reuse and customize the treats. Deluxe Surprize Ball Crackers are also fun to put on the Thanksgiving Table. Deluxe Surprize Ball Thanksgiving Cracker, $17.90. Includes 12 prizes each. Hanukkah: A gift envelope to open each day of Hanukkah. Eight envelopes may include a wish capsule, good fortune, gem, candy, toy, charm, pendant, vintage miniature, and more. Vintage holiday-inspired treasures are tucked carefully within layers of colorful crepe paper--unwind to reveal and celebrate! 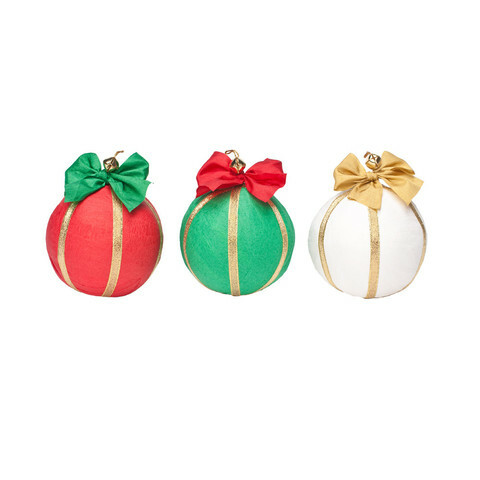 Deluxe Surprize Ball Holiday Ornament, $18.00 Contains 12 prizes. These mini Surprize Holiday gift boxes make great stocking stuffers! 3" mini Surprize Holiday Gift Box, $10. 6 prizes included. The Confetti Fountain contains gold and silver metallic butterflies, hearts, stars and streamers. Compressed air shoots confetti 15 ft. into the air! Confetti Fountain in white, gold and silver, $11.50. Deluxe Surprize Ball New Years Black, $17.00. Deluxe Surprize Ball Party Girl, 18.00. Contains 12 prizes. Here's a look at what's inside a Surprize Ball! Surprises inside vary by style and may include a vintage-inspired toy, keepsake, charm, gem, sweets, confetti popper, fortune, temporary tattoo, quote and more.